Hard drive firmware is about the last place you want to find a bug. But that turned out to be the problem with [BBfoto’s] Seagate HDD which he was using in a RAID array. It stopped working completely, and he later found out the firmware has a bug that makes the drive think it’s permanently in a busy state. There’s a firmware upgrade available, but you have to apply it before the problem shows its face, otherwise you’re out of luck. Some searching led him to a hardware fix for the problem. [Brad Garcia] put together the tutorial which illustrates the steps needed to unbrick the 7200.11 hard drive with the busy state bug. The image in the lower right shows the drive with a piece of paper between the PCB and the connectors which control the head. This is necessary to boot the drive without it hanging due to the bug. From there he issues serial commands to put it into Access Level 2, then removes the cardboard for the rest of the fix. In the tutorial [Brad] uses a serial-TTL converter. [BBfoto] grabbed an Arduino instead, using it as a USB-ttl bridge. [Sprite_TM] cooked up an amazing hack by resurrecting a Mac SE using a Dockstar and ARM processor. The retro hardware had a bad mainboard thanks to the corrosive properties of a failed backup-battery. He had been wanting to do something with the Seagate Dockstar and decided it would find a nice home in the Mac. But what fun is a dead machine housing a headless server? To add to the fun he included an ARM processor running a Mac emulator, along with all the bits to make the screen, keyboard, and peripherals work. When the Mac is off the Dockstar still runs as a server. But one of the best parts is the floppy drive. It still takes floppies, but there’s no magnetic media inside of them anymore. Instead, he’s added an SD card slot and some protoboard in the space for the read head. The drive itself has had the read head transplanted for some pogo pins (hey, we saw those earlier today). When you insert the floppy, the pogo-pins raise up and contact the protoboard, connecting the SD card to a Teensy microcontroller. There’s so much going on with this project we just can’t cover it all here. 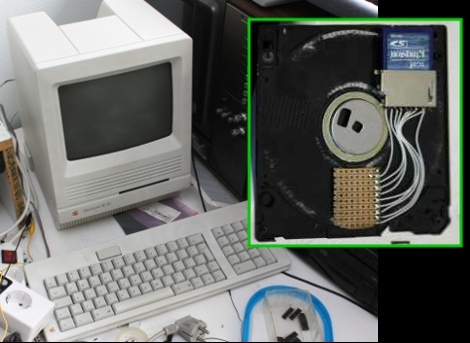 Things like a chemical cleaning to return the original color of the classic case, and building a converter so that the peripherals are USB compatible are just some of the pleasures awaiting you in [Sprite_TM’s] post. He’s also filmed a demo video that we’ve embedded after the break. [Der_picknicker] wrote in to let us know about a guide to building OpenWRT images for the dockstar (translated). What they end up with is a nice little network attached storage device that runs SAMBA and subversion under the umbrella of OpenWRT. 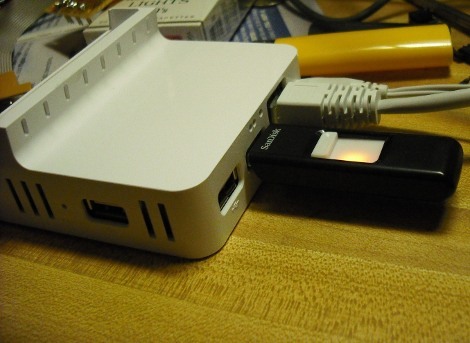 We looked at flashing and building OpenWRT images for this device back in July. The development branch of OpenWRT hasn’t quite reached a stable release yet, but much has been done in the last few months. The machine translation is a little rough, but the compilation process is easy enough to follow. If you don’t care to slog through compiling (which apparently takes 1-2 hours) they’ve also made their images available for download. 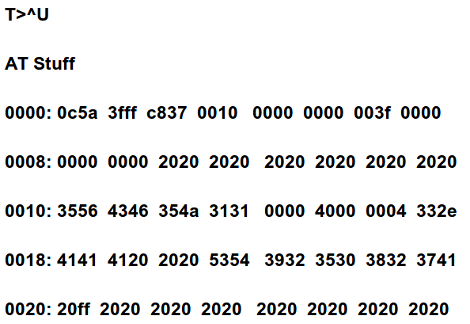 It should be possible to flash via SSH but you might want to add a serial port to the device just to be safe. If you don’t look close you might think this Seagate Dockstar is in stock condition. But look at the three holes in the white case just above the thumb drive which act as a serial connection for the Dockstar. 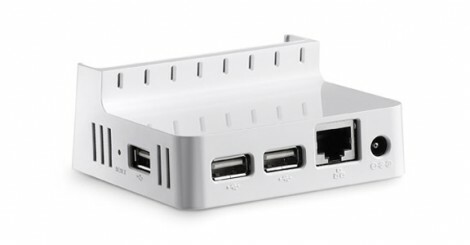 [Firestorm_v1] posted the instructions after see our post about installing OpenWRT on the device. He did a nice job of concealing the connection, heating up a pin header to melt the holes he needed. Now he has quick access without sacrificing features or aesthetics. A serial-to-USB cable is modified with a polarized pin header to ensure a quick and accurate connection. This is great for PC connectivity but you also never know when you want to add your own hardware bits to the network device. The Seagate FreeAgent Dockstar aims to make all of your stuff available online. It serves that purpose but sometimes you just want more options for controlling your hardware and running some scripts. [Eric Cooper] put together a guide for installing OpenWRT on the Dockstar by building your own kernel and loading it onto the internal storage. Once you have a kernel that will play nicely with the hardware, you can install it by tunneling in through SSH; the same method you would use if you wanted to run Linux on this hardware. If you have problems along the way, [Eric’s] also included a guide for cracking the Dockstar open and connecting a serial cable.